Above & Below: Velvet Rope is a vivid coral pink, labeled as a Frost finish at hello-gorgeous.net, where I purchased these. However, the color chart at Jessica's web site labels it as an 'O' for Opalescent. I see it as an Opalescent Shimmer, and a stunning one at that! Below: The photos above were taken under direct lighting with no flash, while the photos below, with a flash, show a slight iridescence in the shimmer. Below: Pashmina is a work-safe, conservative shade of mauve-toned pink. This is labeled as a Metallic finish, which I would agree with. I would say it could also be considered a Frost. Below: I actually like this shade quite a bit. It's delicate and soft, and the silver shimmer adds a nice touch. Below: Starlight Starbright is an extremely dark shade of charcoal grey with fine shimmer that seems to shift from blue-grey to silver. It actually looks like an off-black creme in regular lighting, but does show some shimmer in brighter lighting. This one is labeled as a Creme on both sites. Below: I used a coat of Color Club's Milky White Base Coat over the polish, because that usually tends to pull the darker colors up slightly, but it didn't seem to work in this case! 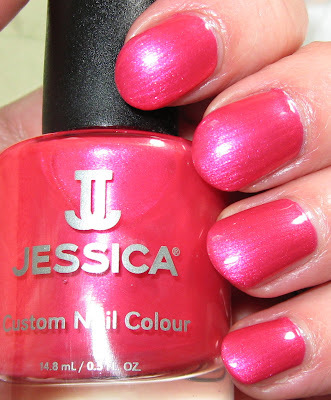 I'll wrap up my weekend posting with a look at the last 3 Jessica Nail Colours I own. There are 2 more posts below this one showing some other shades, if you're interested in checking them out. Again, these all applied very well in 2 coats and I'm quite happy with this brand. They have a fantastic formula that applies nicely, dries quickly, and finishes with a high gloss shine. 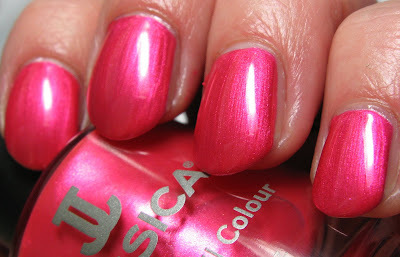 I'm looking forward to getting more Jessica polishes, so if you have any suggestions, I'd be interested in knowing what they are. 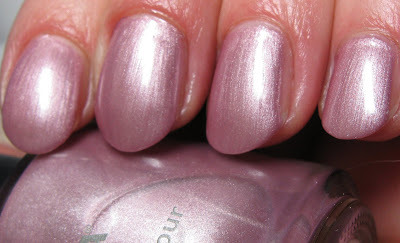 I find the color charts at both Jessica and hello-gorgeous, to be quite 'off' when compared to the actual polish shade, now that I see them in real life. mmm pretty! I like Starlight Starbright...that off-black color...great swatches! What beautiful colors; I really love that first one! 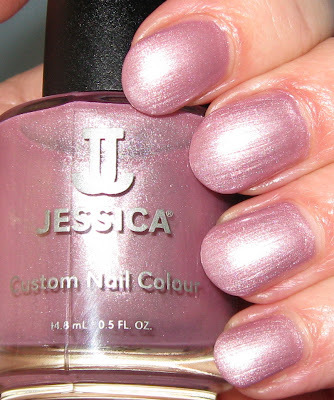 If you like Jessicas then you definetely gotta get Lilac Snowflake, Crimson Dew Drop, Divine Pine, Frost at all cost, Casablanca, Grecian Touch and Venus was her name. AWESOME colors!! Whew! 'Velvet Rope' is a bright one! Beautiful polish's - You did a great job modeling all of these for us! What pretty shades they are. I really like Pashmina. As a matter of fact I have a Pashmina in this shade. I'm going to add this shade to my list. Thanks for showing these beauties! Aurora's Nails~it's a little darker than I anticipated, but I do like it, thank you! hitomi~these really do have a fantastic shine to them all on their own. gildedangel~I liked that one alot too, so glowy! Deez Nailz~thank you and I'm glad you enjoyed them! Happy New Year to you! Lucy~we think alike...I checked to see if I had a pashmina in this shade, but sadly, I didn't. I guess that's a good excuse to get one, to match the polish! rijaH~they're nice, very nice in fact, quality-wise, but I may have chosen differently color-wise had I had a more accurate chart. But I like them, so that's allright.